As people search for ways to curb internet addiction, business websites must prioritize website features that capture attention, new survey says. Jordan DeVries is UX Director at BraveUX, a UX design company in Washington D.C. He believes digital wellness could lead to a decline in users browsing websites. “Customers who might have come across your website in passing may not be there anymore,” DeVries said. 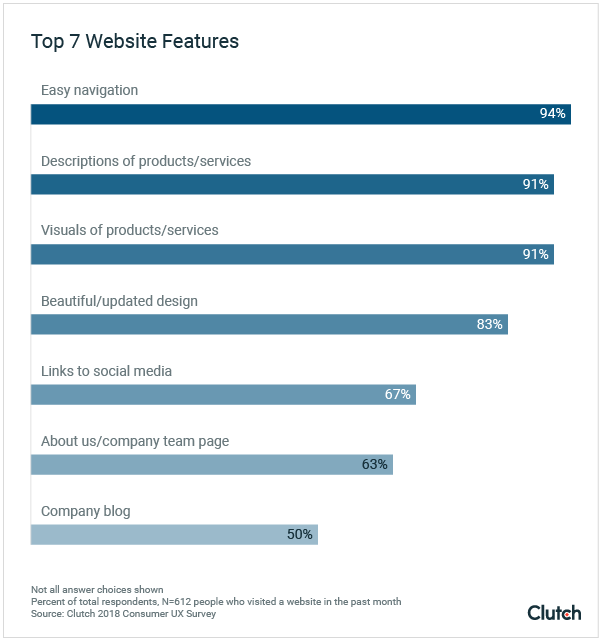 Easy, intuitive navigation is the website feature people want most, according to the survey data. The survey reveals that people value easy navigation because it enables them to access content they want quickly. The survey warns businesses not to sacrifice sleek design for usability. It also recommends making web design timeless to avoid costly redesign efforts. Product descriptions and visuals are the second-most important form of content on a business website, according to the survey. Almost all survey respondents (91%) said they find product descriptions and visuals useful. Short user attention spans challenge businesses to create high-quality blogs and other engaging long-form content for their websites. Half of survey respondents (50%) believe that company blogs are a useful website feature. Clutch surveyed 612 people about their opinions on website features. For questions about the survey, a comment on the findings, or an introduction to the industry experts included in the report, contact Kelsey McKeon at [email protected].